﻿What was the main cause of the French Revolution The year of 1789 to 1799 was a year of radical changes and political upheavals for the country of France. The ?whole country seem[ed] ready for a revolution?. On such a momentous occasion it is easy to reflect with hindsight as to how the constitutional monarchy which had been traditionally used for centuries, to be abruptly overthrown by new ideas such as Enlightenment. However, although Enlightenment did play an important role in the French Revolution it can be argued that the American Revolution was a plausible demonstration in showing the French that they?re country could also be a place of ?equality? and ?freedom of the individual?. Additionally, it is important to take into consideration that even though France had faced great economic difficulties during the year of 1785, mostly concerning taxation, it was one of the most powerful and richest countries in Europe. But, it was because of the ruinously heavy taxation on the impoverished that allowed hatred for the gluttonous lifestyle of the monarchy. The most important cause of the French Revolution was arguably the unfair system of collection of taxes between the Three Estates; the obligations of the Third Estate and the fact that they had no money to upgrade their position, especially if they were peasants. ...read more. Ultimately, the queen was a disgrace to her position and ignorant to the struggles and concern of anyone, heightening the people?s intensity to revolt. Another important cause of French Revolution was the incompetency of Louis XVI who was, like many other rulers, insensitive to the needs of and problems faced by the lower classes. The difference laid in the fact that he was or was perceived to be an incompetent and indecisive monarch. This indecisiveness caused him to surrender to opposition in court, thus leading him to fail to set up a limited constitutional monarchy, or respond to the need for introducing tax reforms. For example, the appointed financial advisor of the time, Jacques Necker, realised that there was a need for a tax reform, since the current tax system subjected the lower classes to pay high taxes while allowing numerous unfair tax exemptions for the nobles and clergy. Naturally, such a proposed reform met with opposition from the ministers, and the incompetent king yet again backed down and rejected the appeal. Eventually, the king dismissed Necker, which led to the one of the significant events in the revolution, the Storming of the Bastille. This king, who was easily influenced by his ministers, can be seen as one of the main reasons for which no improvements were made by the state to introduce new laws which benefited the people. ...read more. The King was weak and had no discipline, while his wife was ignorant to the needs of the people. Along with France was in debt and economically high prices and famine caused the march to the Versailles. France was in a deteriorating situation where Enlightenment and the American Revolution showed the people and influenced them to act. However, if it had not been for the drastic differences and privileges between the Three Estates then other factors would not have needed to occur. The unfair tax system of people who had little and needed to give a lot, was a system open for ridicule and was a system waiting to explode into an angry revolution. To some extent at least, it came not because France was backward, but because the country's economic and intellectual was not matched by social and political change." These two factors majorly led to the cause of the French Revolution. ________________  John P miller  (Citizen: A Chronicle of the French Revolution, Simon Schama at 65  Charles Francois writes about French participants in the American War of Independence  Stated by Voltaire  Jean-Jacques Rousseau - Father of the French Revolution  The Social Compact? ?That we are morally responsible for the state of the social world, if it is corrupt it is because we tolerate it.? 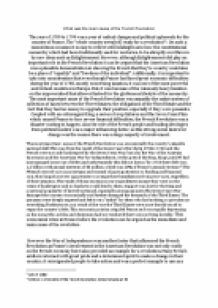 Rousseau  Speech of Marquis de Condorcet (December 3, 1792) ...read more. To what extent did Alexander II's reforms cause more problems than they solved? There was also a new system of army education with better officer training; more open promotion and military colonies and constriction as a punishment were ended. These encouraged young men to gain more education (as their years in service were reduced). 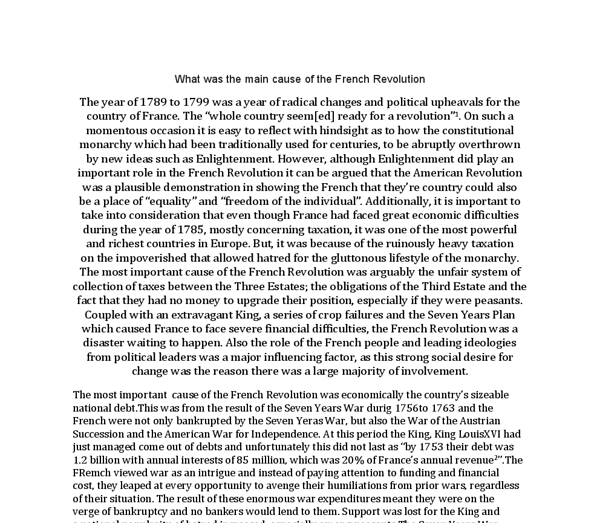 French Revolution: Success or Failure? pre- revolutionary level at a time when other prices had more than doubled. Two months later, the Assembly followed by passing its first Maximum Law (Rude 84). France had serious problems to handle the 'double' prices of food, thus, Paris Commune determined to introduce the Law of Maximum after few months. bourgeoisie who earned their wealth through an expanding overseas trade and from the manufacture of goods such as woolen and silk textiles that were either exported or bought by the richer merchants of the society. In addition to merchants and manufacturers, the Third Estate included professionals such as lawyers, doctors, administrative officials. * However, the Wall Street Crash in America hit Italy hard, unemployment rose to over 2 million by 1933 and living standards for most ordinary Italians fell. * The government obliged industrial workers to accept wage cuts in 1930 and 1934, whilst agricultural wages dropped by between 20 to 40% during the 1930s. However, after his death, his brother James took over the throne as James II. James II's reign further exasperated the religious crisis that was plaguing England. Being a devout Catholic, James II passed many laws that favored Catholics. Thus, his views ensured that he would come in conflict with the Parliament, which was mostly made up of Protestants. The educated class also gets influenced by the scholar of the 16th century on many accounts of good government. They desire a new government, a good government. An opportunity emerges on the 18th century when the government of Louis XVI bankrupt.